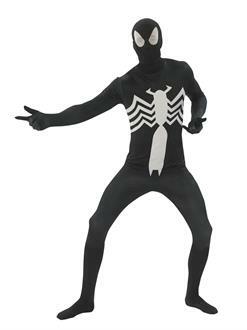 Spidey still knows how to party, and this Black Amazing Spider-Man Skin Suit Costume is bad to the core! This black and white whole-body suit is made of thin, breathable spandex that covers the entire body and features the iconic white spider symbol on the front. It’s very stretchy and comfortable and fastens by a double zipper for quick and convenient in and out.